As much as I would like to reserve my writings here to Lakewood, I feel an obligation to my readers to discuss all available lakefront properties in our area of West Tennessee. At the present time there are only 2 properties for sale at Lakewood(that we have already mentioned) that have not changed in status or price. There is however, a property I previewed yesterday that we need to discuss. I have included on this posting a picture of the front of the house and a picture taken right behind the house. Right across the road(in front of this house ) is a 2-3 acre lake. So, you have a waterview in front and in the rear of the house. The lake in back of the house is part of this property and it is loaded with hugh catfish. I am not sure of the fish in the lake across the road. 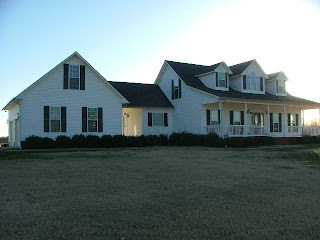 This is a 3 Bedroom, 2 full and 2 half baths home on 5.5 acres. It has approximately 2300' of heated area and a 2 car garage attached to the house(by breezeway). There is also a separate outbuilding/wired shop. This is one beautiful piece of property and it is priced at $249,900. 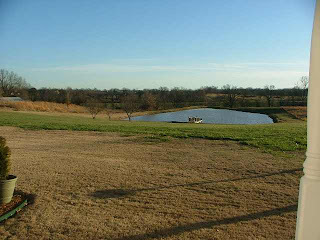 This property is located in the county and is about 15 minutes from Dyersburg,Tennessee.